Mouse anti Human MMP-9 Activated antibody, clone 4A3 recognizes the active form of human matrix metalloproteinase 9 (MMP-9). The MMP’s are zinc-dependent endopeptidases responsible for degrading the extracellular matrix. They are also involved in cell proliferation, migration, differentiation and apoptosis. Most MMP’s are synthesised as inactive zymogens and a propeptide region must be cleaved off before the enzyme becomes active. Their expression is increased dramatically in a variety of cancer types, where it indicates invasive disease and a poor prognosis. MMP-9 is a gelatinase, cleaving type IV collagen and gelatin. The gelatinases have an additional gelatin-binding domain inserted in the catalytic domain. MMP-9, alongside other MMPs, plays a role in normal tissue remodeling such as embryonic development, ovulation, mammary gland involution and wound healing. It is important in the early stages of tumor invasion as it degrades the type IV collagen in the basement membrane.  Mouse anti Human MMP-9 Activated antibody, clone 4A3 recognizes only the active form of MMP-9. It does not react with the MMP-9 proenzyme or the active or proenzyme forms of MMP-2. Ovalbumin conjugated synthetic peptide corresponding to a region within the N-terminus of human MMP-9. Spleen cells from immunised Balb/c mice were fused with cells of the Ag8563 myeloma cell line. MCA2736 detects a band of approximately 63kDa. Duncan, M.E. et al. (1998) Human matrix metalloproteinase-9: activation by limited trypsin treatment and generation of monoclonal antibodies specific for the activated form. Eur J Biochem. 258 (1): 37-43. Šelemetjev S et al. (2016) Coexpressed High Levels of VEGF-C and Active MMP-9 Are Associated With Lymphatic Spreading and Local Invasiveness of Papillary Thyroid Carcinoma.